Cliftonville have suffered a setback ahead of the league clash at Coleraine with Stephen Garrett likely to miss the rest of the season. The forward sustained a suspected cruciate knee ligament injury in Tuesday's Co Antrim Shield victory over Ards at Clandeboye Park. The Reds top the Premiership on goal difference from Portadown. Ports boss Ronnie McFall has picked up the Manager of the Month award as he prepares to face Crusaders at Seaview. Portadown won all five league games in November, including a derby win over Glenavon, to put themselves firmly in title contention. 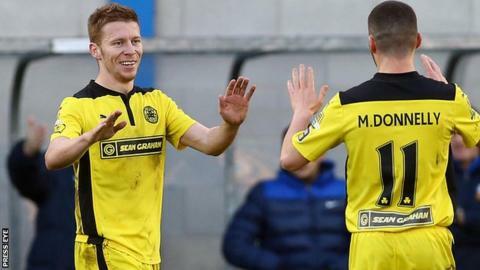 Crusaders host Portadown in Saturday Sportsound's feature game with Michael McNamee presenting the programme on Radio Ulster from 14:00 GMT. Joel Taggart will be on commentary at Seaview with Liam Beckett providing analysis. There's also coverage of Coleraine v Cliftonville with Michael Clarke and Roy Walker taking you through the action. There will be regular updates from Saturday's other three Premiership matches. "We are playing well and in a good position at the minute. But as usual with this award, it was the players who won it for me so I thank them," said McFall. The Crues are three points back in fourth and the north Belfast side will be looking to bounce back from the shock midweek defeat by Bangor in the Co Antrim Shield. "It's a massive game of football for us - we are three points adrift and we don't want be top be falling further behind," said Crusaders manager Stephen Baxter. "Portadown are the top team in the country, they are the ones that have that little edge about them and they have high quality players throughout the team. "They are well organised, their manager has been there and done it, so we will need the performance we had against Cliftonville a few weeks and one that is much better than that against Bangor." Linfield are just two points behind the top two and they travel to take on a Ballymena United side with just one win from their last 10 league matches. The 7-0 thumping by Cliftonville last weekend will be fresh in the minds of the Sky Blues, who will be without the suspended Davy Munster. Glentoran pair Calum Birney and Stephen McAlorum are banned for the game against Ballinamallard at Ferney Park. The bottom two meet at Milltown, with basement boys Warrenpoint Town six points behind Dungannon Swifts.